‘Chicago restaurants.’ ‘Jewelry stores 60010.’ ‘Car dealerships Cleveland, OH.’ Why is this type of search query important to your business? Because they are happening all the time. Google confirmed in a recent blog post that 1 out of every 5 searches are location related. Also, for those searching on a mobile phone, 1 in 3 searches have local intent. With local searches dominating, businesses need to be showing up to keep current customers and gain new ones. You may have noticed that three dry cleaners (Lake City Cleaners, Schwatzhoff Cleaners and BC Cleaners) have taken over almost 50% of Google’s listings when there are at least 10 dry cleaners in the Evanston area. I’m sure that many business owners would like to own 2 or 3 or more listings on a non-branded and very relevant query. Now, I’m sure you are asking, why then can these three businesses dominate like this and how can I do it too? Though all of the following suggestions may not give you total dominance for local searches, it can help you gain more local traction and can give your customers more information, no matter the platform. This first suggestion may be obvious: optimize your own site first. 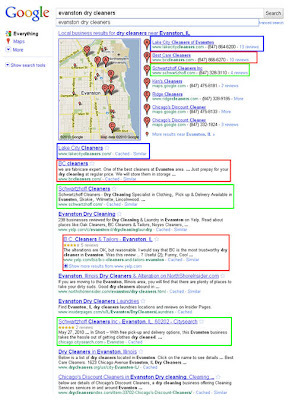 If you notice on the ‘evanston dry cleaners’ search, many of the dry cleaners websites shows up first. So, make sure you optimize for keywords that are related to your business offering and make it easy for customers (and search engines) to find where your locations are. The best way to do this is to make sure that you have a unique page for each store location, per Matt Cutts’ suggestion. The next step is to take advantage of free local programs on the big 3 search engines: Google Places, Yahoo! Local and Bing Local Listing Center. Many of these listings will show up naturally and can give searchers more information about the brands you sell, products and services, photos, reviews and more. Also, as the business owner, you can make edits and changes whenever you need to. The last local search area to tackle: local directories. This includes Yelp, Citysearch, Yellowpages.com, Superpages.com and many, MANY more. These directories often show up for local searches (you may have noticed that Yelp and Citysearch popped up for the dry cleaner SERP) and get a large amount of traffic from search engines. 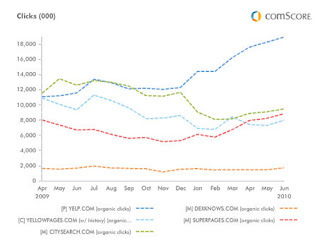 The graph below from comScore shows just how much traffic some directories are getting. Yelp, for example, received over 18.9 million clicks in one month. I bet you would like to get some of those clicks going to your business listing on Yelp! Creating listings on these types of local directories is pretty straightforward, but if you are intimidated by the number of directories available or maybe you have hundreds or thousands of stores, you can create new listings with the help of a data supplier (e.g. Universal Business Listing, Localeze). This usually includes a fee, but it can be very helpful for those businesses that don’t have the time or man power to individually post new stores. So, go out there and get your business ready for local search: Create individual store pages on your site, set up local accounts on Google, Yahoo! and Bing, and create listings on the many available local directories. Then watch to see if your business can compete with your competitors on the local search results pages!